The clocks have been set back, and the daylight hours are dwindling. As the last leaves fall from the trees, and the sun changes position in the sky, you may notice a fluctuation of natural light within your home. Based on these changes, it may be necessary to move light loving plants to a sunnier spot. Lacking light this time of year? No problem. According to the University of Missouri Extension, “Artificial lighting, if properly designed, allows plants to be grown indoors in nearly any setting.” When it comes to artificial lighting, most indoor gardeners depend on fluorescent tubes for their ease of use, economical price tag, and energy efficiency. Throughout the year, houseplants are exposed to environmental elements such as cleaning products, dust, and pollen. In order to “breathe” and absorb light, leaves need to be clean. Use a damp cloth to wipe down the tops and bottoms of leaves, or give them an occasional shower. When it comes to feeding houseplants over the winter months, there is no need to go overboard. In fact, UNH Cooperative Extension Education Center Coordinator Emma Erler suggests fertilizing houseplants during the active growing season from March through September, allowing for a rest period over the winter months. Erler suggests choosing a balanced fertilizer such as 10-10-10. Be on the lookout for signs of over fertilization such as burning leaves and/or the accumulation of a crusty white substance on the outside of the pot. The UNH Cooperative Extension recommends “leaching” excess fertilizer by periodically flushing the plant with water and allowing to fully drain. When it comes to water, houseplants tend to suffer from Goldilocks syndrome. One common problem is overwatering. If a plant receives too much water, leaves will begin to wilt and roots will rot, leading to eventual death. Be sure to use your finger to check the soil moisture at a depth of 2 inches. When plants are dry, water thoroughly. 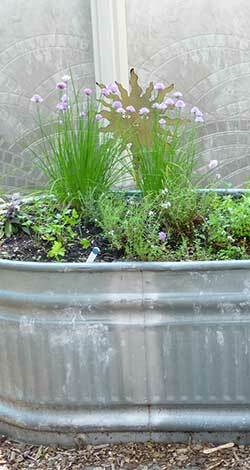 Allow excess water to drain from the pot, but do not leave plants sitting in the standing water. Divide & Plant: Fall is a great time to divide hostas, peonies, and lilies. Since the fall of 2017 has proven to be abnormally warm, there is still a little time left for planting in Belknap County. With that said, keep an eye on the weather forecast to ensure you allow enough time for roots to establish before the cold sets in. To aid this process, water newly established plants right up until the ground begins to freeze. Simply use pruners and shears to cut back plants, but leave debris to help feed the garden. This will not only save on time, but will also help to improve soil quality. Leave the seeds of Black-Eyed Susan and Echinacea Coneflower for birds to feed on over the winter months. Other perennials such as lily stalks and ornamental grasses can serve as a garden focal point over the dreary winter months. Protect: The howling wind and icy temperatures aren’t too far away. Use the months of October/November to ensure tender plants and shrubs are protected from the elements. A blanket of straw can be used to protect plants such as strawberries and blueberries; look to burlap to wrap hydrangeas and ornamental evergreens; and rely on wooden structures to provide shelter for immature azaleas and rhododendrons. Check out the following fact sheets for more tips: winter protection for roses and evergreens. Clean & Store Supplies: Once the growing season has come to an end, its time to clean and store garden supplies and tools. Start by removing any soil or debris from the tools. Follow this step by disinfecting clippers and shears by either soaking in a bleach solution for 20 minutes, wiping down with rubbing alcohol, or using disinfectant wipes. This is also a great time of year to sharpen blades to ensure clean cuts in the future. Store ceramic pots and tools in a garage, shed, or basement. Don’t forget the hose; and be sure to turn off the water supply to spigots. Over 20 students from the Sanbornton Central School After School Program teamed up with Master Gardener Sandy Licata to implement a community garden at the Sanbornton Public Library. The kids enjoyed getting their hands dirty and were enthusiastic to see what they could grow. The 3×3 raised beds included marigolds, kale, cherry tomatoes, peppers, peas, and various herbs, which were available for students to take home. The library embraced the garden and utilized the project to promote programing related to healthy eating and living. A big shout out to all volunteers who planned, planted, watered, and harvested! Find the freshest food in season at our local Farmers’ Markets. You won’t have to travel very far – Farmers’ Markets are springing up in many Belknap County communities. Support your local farmers, businesses and communities. And a bonus reason to visit the Farmers’ Markets in Gilford and Laconia Main Street – meet Belknap County Master Gardeners to learn about the services offered by the University of New Hampshire Cooperative Extension and pick-up tips for making the best of your gardening. Held every Saturday morning through October 7 from 9am to noon, the Barnstead Farmers’ Market is conveniently located on the corner of Route 28 and Maple Street in Center Barnstead. You’ll find fresh produce including heirloom vegetables, assorted bakery goods – including many that are gluten free, herbs, jellies and jams, locally grown meat and poultry, numerous crafts and locally roasted coffee to enjoy while you browse the many choices on offer. Find more information on the Barnstead Farmers’ Market website. The Belmont Farmers’ Market will be held on July 30, August 27 and September 17 at the Belmont Park and Ride, 798 Laconia Road (Route 106). A feature of this market is a demonstration event – at the June 25th market, Christian and Colton Workman demonstrated their blacksmith skills for all to enjoy. Fresh produce, baked goods and crafts are featured each month. Check the Belmont website for updated information on the current month’s features. Learn from and ask questions of Belknap County’s Master Gardeners at the Gilford Farmers’ Market each Saturday from 9am to noon. Located on the grounds of the historic Benjamin Rowe House, 88 Belknap Mountain Road – just off Route 11A – this market includes tasty fresh vegetables and fruits, baked goods, meat and dairy products, plants, crafts and entertainment. Laconia has 2 Farmers’ Markets – one on Thursday afternoons and the other on Saturdays. The Laconia Main Street Marketplace is held through September on Thursday afternoons from 3pm to 6m in the Municipal Parking lot between Main and Pleasant Streets. Stop by to shop for fresh seasonal fruit and vegetables, dairy products, maple syrup, meat and herbs. You’ll also find flowers, plants, crafts and tasty baked goods. As an added bonus, look for the Belknap County Master Gardeners’ table for information on the University of New Hampshire Cooperative Extension’s programs, soil testing and more! You can find more information on the Laconia Main Street Marketplace on their Facebook page. Nearby, at the Laconia City Hall Parking Lot on Beacon Street East, the Laconia Farmers’ Market is held each Saturday morning from 8:30am to 12:30pm. You’ll find choices to tempt you among the fruits, vegetables, cheese, garlic and baked goods – including gluten-free along with locally-made crafts and soap. More information can be found on the Laconia Farmers’ Market website. The Open Air Farmers’ Market of New Hampton is held from 9am to 2pm on the first and third Saturday of each month from July through October on the corner of Winona and Sanborn Roads. In addition to the offerings from local farmers and craftspeople, you’ll be able to enjoy a grilled lunch, entertainment and discussions with local farmers. Check the Open Air Farmers’ Market of New Hampton’s website for more information and special events. Wherever your travels take you in our vibrant county, plan to stop by our Farmers’Markets to pick up good things to eat. Before you buy fertilizer for your garden, have your soil tested to discover what you really need. Spring is finally here and you’re ready to plant a new flower garden or prepare your existing veggie garden for this year’s harvest. Before you race off to the local nursery or big box store for plants and fertilizer, consider how testing your soil can save you heaps of time and money. The soil in Belknap County varies considerably. In fact, different areas in your yard may have different soil depending on the former uses of the land, how much top soil the home builder added and the plantings you’ve made. pH level – Soils in New Hampshire tend to be acidic (pH levels below 7.0). Your choice of plants may need additional lime or wood ash to increase alkalinity. Organic matter content – compost and manure improves soil structure and can provide needed plant nutrients. Nutrient levels – plants get their nutrients from the soil. 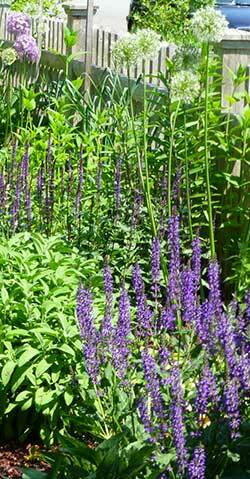 What to Plant: In addition to requirements for sun or shade, different plants require different nutrients and pH levels. If the soil qualities where you intend to plant will require a lot of additives, you may decide to take on the additional work, plant something more suited to the existing soil or choose a different location with better soil for your plants. Healthy Plants: Having the optimum level of nutrients in your soil promotes healthier plants. A stressed plant that is deprived of nutrients is more prone to disease and insect attacks. Additionally, when your plants are healthy, they’ll be more productive. You’ll see more growth, larger flowers and more vegetables. Save Money: You’ll save money if you buy only the fertilizer your soil needs to provide the nutrients for what you’re planting. With so many different choices available, it’s difficult to choose which would be best. With the results of a soil test, you’ll know exactly what you need to add – and if you need to add anything! Save Time: You won’t spend your time adding unnecessary fertilizer or additives to your soil when you don’t need them. The best way to know exactly what you do need for your garden is from a soil test. Environmental Benefits: Fertilizer and compost can damage drinking water and the many lakes, rivers and streams in Belknap County. Applying fertilizer with nitrogen and/or phosphorus increases the likelihood that some will leech into the groundwater or run off into surface water areas. By having your soil tested, you’ll find out if your soil has enough nitrogen and phosphorus to reward you with a healthy, environmentally friendly lawn and/or garden without adding more. Lead Contamination: Lead is present in all soils, usually in very low concentrations. The amount of lead in soil can increased due to factors like – items buried underground in past years, chips of dust from lead-based paint, and/or spills of leaded gasoline used pre-1990s. Most of us do not know what has been done on our land in previous years. Screening for lead levels in your soil is important because excessive lead can affect health, especially in children. Soil tests facilitated by the UNH Cooperative Extension include lead screening. Expert Results: Do-it-yourself products are available at nursery centers and big box stores to test your soil. These tests provide an approximation of the pH level of your soil but are often unreliable. A UNH Cooperative Extension soil test provides an accurate, comprehensive analysis of your soil with specific recommendations for the plants you want to grow. Submitting the material required for a soil test is detailed on the UNH Cooperative Extension website. Collecting your Soil: For accurate results, it is important to follow the instructions for taking a soil sample especially the depth from which the soil is taken and mixing several samples from your gardening area together. Completing the Form: Home Gardeners should download, complete, print and include this form. If you’re considering planting different crops in your garden, be sure to indicate each of these under the section for Crop Codes. Naming your sample is important if you’re sending multiple samples at the same time. Answers to Questions: Complete information on submitting the form and soil, and the time frame for results can be found on the Home Soil Testing Frequently Asked Questions page. Soil tests are processed at the UNH Cooperative Extension’s facility in Durham. You can either deliver your sample/s in person or send them by mail. A sample of 1-2 cups fits easily inside the US Postal Service’s small Priority Box for easy mailing. Here’s to testing your way to a happy, healthy garden this summer! Spring is finally here! We may be looking out at a fresh blanket of snow, but farmers across the state of New Hampshire are gearing up for a busy growing season. Early spring is a great time to get to know your local farmers by inquiring about various Community Supported Agriculture (CSA) options. From weekly shares of fresh produce, bouquets, herbs and flowers, to farm fresh eggs and freshly baked bread, CSA farm shares provide patrons with fresh, locally sourced options throughout the harvest season. Although you may have a few raised beds in your backyard, chances are you lack time, space, or adequate sunlight to reap the benefits of a bountiful garden. By purchasing farm shares from a professional gardener, you are sure to have picture perfect tomatoes, along with enough cucumbers to pickle. Grocery stores certainly serve a purpose. Without them, we wouldn’t have access to a rainbow of fruits and vegetables over the winter months. With that said, there is something magical about tasting the first farm fresh tomato of the summer. When you make the choice to buy local, you are making an investment in both your health, as well as the overall economy of your community. When it comes to farm shares, you never quite know what you are going to get. From spinach, kale, and radishes in the spring, to tomatoes, cukes, and corn in the summer, you will have plenty of opportunities to test out different recipes throughout the season. Once fall arrives, you can experiment with various types of squash and plenty of potatoes for cold storage. If you like the idea of eating local, but don’t want to commit to a farm share program, make a point of visiting a weekly farmers market or check out a few of the Belknap/Carroll county farms listed in the Lakes Region Local Food Guide. Photo: A young Belknap County resident enjoys exploring a farm share basket from Moulton Farm in Meredith.